SonjaK - The Art of Stamping: Glückwunsch! Meine heutige Karte ist wieder etwas winterlicher geraten. Das knuffige Lama von Neat & Tangled war lange überall ausverkauft, und nachdem ich es schließlich ergattern konnte, musste ich es natürlich sofort verarbeiten. Today's card is more winter themed again. For quite some time the adorable llama by Neat & Tangled had been sold out everywhere, so when I finally could lay my hands on it, I had to create something with it immadiately. Koloriert habe ich den flauschigen Kerl mit Copics. Dabei habe ich mich mit der Frage nach der Struktur des Fells ein wenig schwer getan. Eigentlich ist so ein Lamafell ja recht zottelig. Allerdings hat dieses spezielle Lama - wenn man von der Kontur des Motivs ausgeht - ein Lockenköpfchen, während das Fell am Unterkörper eher glatt wirkt. Dementsprechend habe ich es nun koloriert. Mal schauen, ob mir irgendwann auch eine zottelige Koloration gelingt. I colored the fluffy guy with Copics, and had a rather difficult time deciding upon the correct fur structure. Basically, llamas look rather shaggy. According to the image's outlines, this particular fellow, however, has a curly head and rather smooth fur on the lower body. In the end, that too, is the way I colored it. Let's see if I'll someday also manage a more shaggy coloring. 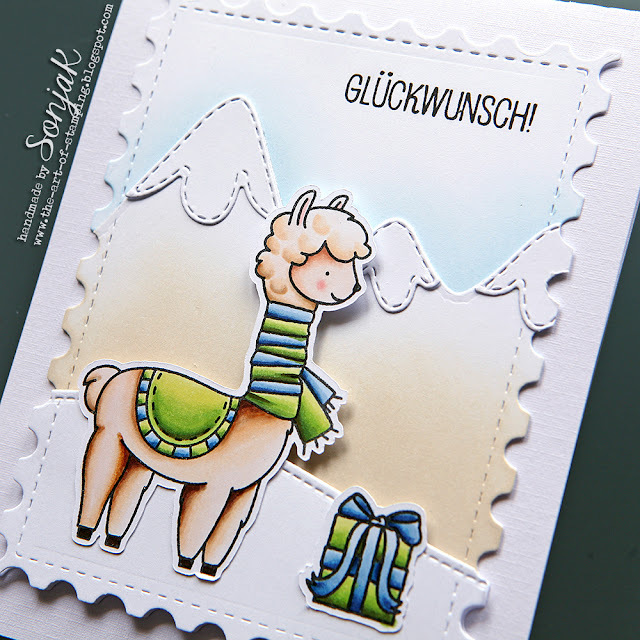 Stempel | stamps: Neat & Tangled "Fa La Lama", Create A Smile Stamps "Hey, Quatschkopf"
Stempelkissen | inks: MFT Hybrid Ink "Extreme Black", Versafine "Onyx Black"
Stanzen | dies: Lawn Fawn "Stitched Hillside Borders", Mama Elephant "Snow Capped Mountains", ?? "Postage Stamp Rectangles"
A darling card, Sonja! Love those blues and greens! Thanks for playing with us at the Simon Says Stamp Wednesday challenge!